I’m a firm believer in making environment a “character” when writing a story. Apart from being key in creating ambiance, having the physical landscape and social circumstances shape how the people interact with each other can make for more dynamic character motivations and more dynamic relationships, too! My Missing Cities series depends on the sparse population of rural environments in affecting relationships. One of the reasons I chose this setting is to contrast the isolation of the environment with the burgeoning closeness of the main characters. How, I asked myself, do landscape and slapdash community influence how people relate to each other? Isolation plays a pretty key theme in Farm of Fancy, which is something I made obvious from the very first scene. The first chapter opens with Gabe waking up and meditating on the upsides and downsides of living alone on the edge of town. Although under different circumstances, David, too, is feeling isolated by his environment: Gabe and David both find it difficult to be authentically themselves in Armstrong. The ability of each of them to show the other who he is and be understood despite their environment is a strong motivating bond of the relationship between David and Gabe—but that doesn’t mean it’s an easy road to get there. Another thing that I find really important in my writing process is to establish realistic dialogue—which means that people don’t always understand each other, and that it sometimes takes some work to get to the real meaning of what the other is saying. 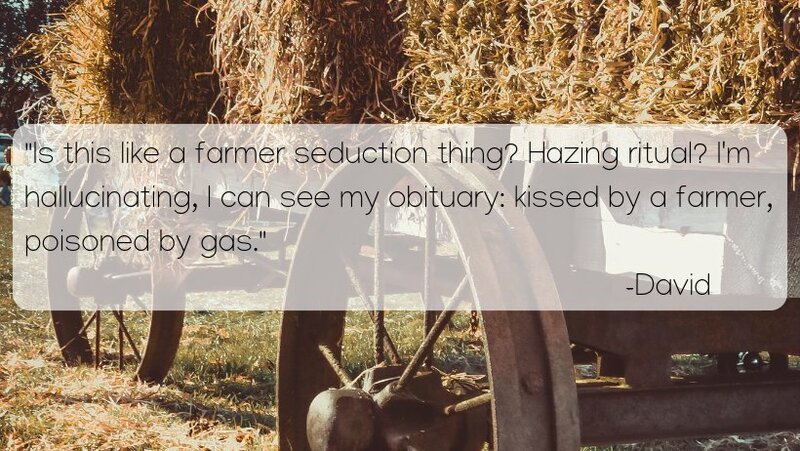 In Farm of Fancy, miscommunication motivates the plot a lot! From the very first chapter, Gabe sabotages his interactions with David because he’s wary of his attraction to David. As the story progresses, the reasons for his sabotage become increasingly obvious. Although Gabe knows he is different in the town and doesn’t hide it, bad experiences in Armstrong mean that he’s wary about identifying as gay around people he doesn’t know. Communication from Gabe stays awkward, sabotaging, and stilted as a result until David outs himself to Gabe in chapter 4—at which point Gabe opens up considerably, even if it’s still pretty difficult for him to express himself clearly. David, too, finds difficulty in presenting himself authentically in the town. After spending more than fifteen years frequenting Toronto’s gay village, a move to Armstrong—with no obvious gay community—is a bit of a shock. Like Gabe, he derives a lot of strength from the quiet and solitude, but being mistaken for straight is something he hasn’t experienced to this degree for a long time. As a result, he’s a little wary about being open about his orientation in a town where he’s trying to build a business. It takes several meetings for him to come out to Gabe, even though he picks up on Gabe’s evaluation of his appearance—and even then it’s a bit of an accident, and something he’s prepared to regret. The number one most important thing when making miscommunication a plot device is making sure miscommunications are motivated. Using the environment as a prop is one really great way to help develop those motivations. It can justify Gabe’s self-sabotage in conversation, justify why David never tells Gabe that he didn’t just get divorced until Gabe insults his deceased husband, and creates a physical distance that allows David and Gabe to coexist in a small town without ever forcing a conflict—and give Gabe’s sister the close encounter she needs to try to re-establish communication between them when it falls apart completely. Environment matters so much to communication—be it physically, socially, or politically. Giving environment the attention it deserves in writing can help characters’ motivations and can help the plot along, too—not to mention its usefulness in pacing, worldbuilding, and usefulness in foreshadowing, if you play your cards right! You’ve loved the post? Well, me too. Below read my thoughts about the book. 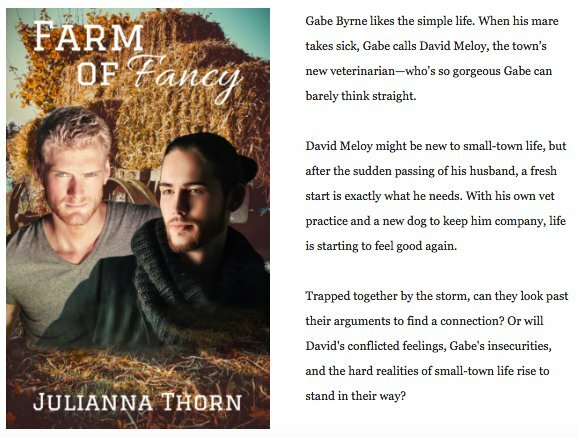 FARM OF FANCY is an 74,000 word meet-ugly-turned-cute HEA romance—the first in a series of standalone novels about gay life in rural British Columbia.